Are National Australia Bank Ltd. (ASX:NAB) Shares Worth $29? Are National Australia Bank Ltd. (ASX: NAB) shares worth $29? According to data from The Wall Street Journal, of the 15 analysts they surveyed a total of 11 agree that NAB shares are worthy of a position in investors’ portfolios today. The analysts’ average valuation is around $29.60. Meaning, despite all of the bad press about falling house prices, an interest-only investor ‘cliff’ and a topsy-turvy political situation, 70% of the professional analysts think NAB shares will beat the market. NAB is one of the four largest financial institutions in Australia in terms of market capitalisation, earnings and customers. However, in 2018, NAB was Australia’s largest lender to businesses and has operations in wealth management and residential lending. NAB is also one of the highest-yielding dividend shares on the ASX, with a dividend yield of 8.2% fully franked. That compares to Commonwealth Bank of Australia’s (ASX: CBA) 6.1% and Westpac Bank’s (ASX: WBC) 7.4%. Why are NAB shares falling? I’m not one to speculate on short-term share price movements but I’ll do my best to explain why NAB shares have fallen ~19% over the past year. Labor plans to scrap franking credits for some investors. The opposition party has announced it will curb franking credit refunds to some investors. That means the dividends paid by companies like NAB won’t be as appealing. NAB has been a bad bank. During the Royal Commission into the banks it was revealed NAB had, at times, shown to have extremely poor lending standards or practices. The property market is slowing. Recent data shows the Australian property market is cooling off. This could be a result of tighter lending standards or prices simply coming back to reality. What are NAB shares worth? A simple share valuation technique anyone can use to value bank shares is something called a dividend discount model (DDM). I explain all of the major valuation techniques (and provide a template) in Rask’s free valuation courses. Let’s say NAB’s annual dividends are sustainable. It has paid $1.98 per share in yearly dividends for as long as I can remember, but keep in mind the three key risks outlined above. 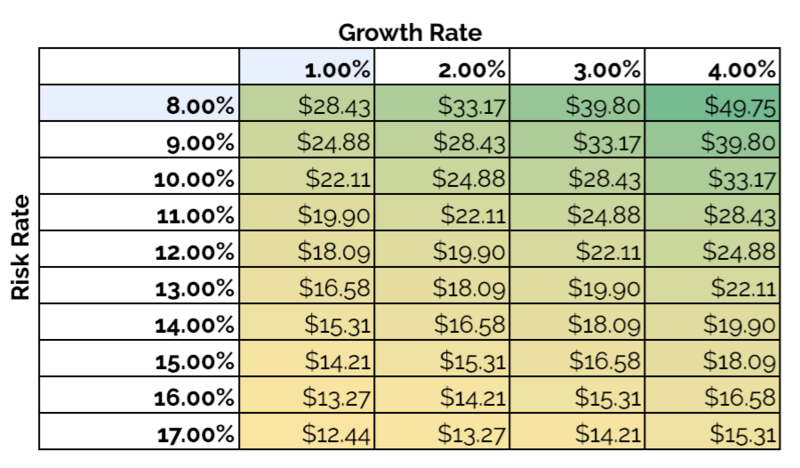 The following table shows the valuation of NAB shares under different assumptions of risk (left-hand side) and long-term growth (top row). As you can see, the range of outcomes for NAB’s share price is quite broad. That’s because the important part of any valuation is what you put into the model — not the model itself. Given NAB’s dividend has not increased for years and there are risks, a prudent valuation for NAB may be in the range of $22 to $25 in my opinion. As I’ve said many times before, I prefer small cap shares in Australia. But if I was going to buy NAB shares for the dividends, I would like to buy the shares when they’re trading at least 30% below what I thought they were worth. Meaning, at the current share price of $24, NAB shares are not a bargain in my book – regardless of what other analysts think.